So, a few days ago, ActForex came out with a new Platform, simply dubbed : “the new ActForex Trader”. Fair enough. Recently I decided to download a demo copy of their new platform, just to see how it works and what are it’s useful and defining features. Please note this is not an in-depth review of their new platform, that would take a long time. This is just a quick overview of the platform and what I think stands out. The initial download package is pretty small, much smaller than MT4 actually, comprising of only a few kilobytes, similar to when downloading Real Player. Obviously you know straight away that the actual platform can’t be that small, so as I proceeded to install, naturally it started to download more files. It only took a couple of minutes if that, and installation was seamless. As the platform loads, I noticed how quick it was in load time. Hard to say whether it was faster than MT4, because this partly depends on your internet connection speed, since it connects to the server first for authorisation before loading (as opposed to MT4 which authorises after loading). So upon loading, what do we have? My first impressions are that if you were to ask Babypips to build a forex trading platform, you might end up something like this. It *looks* very simple. Easy on the eye. Definitely a good thing. The prices of pairs are clearly laid out on the left hand column, much clearer than MT4. The disadvantage of having such large price blocks of course is that it takes up much of the screen, especially of your charts. Having said that, the good news is that the actual charts are very clear indeed. Whenever I load MT4, I need to change the default green/black/white colour scheme because it can be a bit of an eye sore. ActForex’s default colour scheme is however very nice, not so dissimilar to my primary choice of colours in fact, and I could definite trade comfortably with this scheme. Do not underestimate the importance of a colour scheme and being comfortable with it. Then we have tabs, in fact, very similar to Mozilla Firefox’s tabbing abilities. 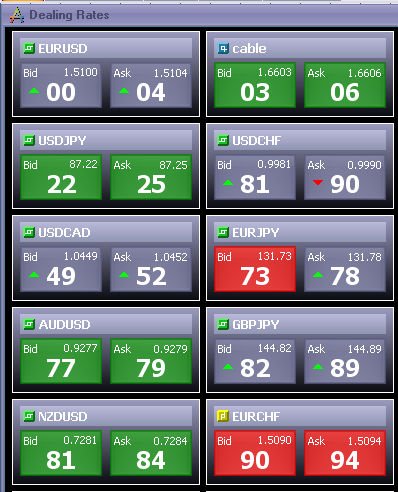 So there is the “Main”, which is of course the main default screen you get when loading up ActForex’s new platform. There is “Trading Info”, which gives details on what trades you currently have open, and which ones you’ve closed, in addition to an MT4 style of showing current rates. There is the “Charts” tab which eliminates everything from the screen except for … charts. The is the “reports” tab for generating historical data, and finally the “Strategies” tab, which allows you to load, devise and edit your own automated trading methodologies. As for indicators, the “heart” of many forex traders, then this is a simple task of right mouse clicking on your chart, and then on “setup indicators”. Couldn’t be any simpler really. There are a ton of other features actually, such as links to Google Finance, Yahoo Finance, Reuters, an online help, an in-built price alerter, and others. What’s more, if you’re overwhelmed by all these features, ActForex have designed their platform in such a way that you can actually choose whether to load the platform in a “basic” mode, an “intermediate” mode, or an “advanced” mode. 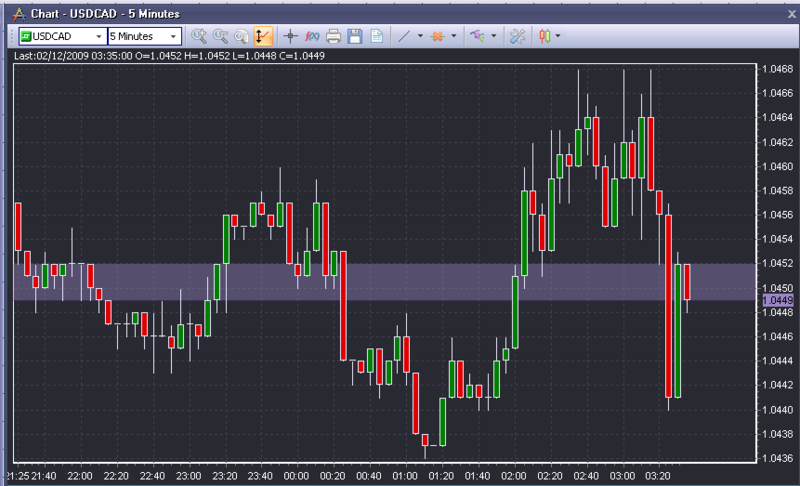 Very helpful for those starting out in Forex. Even though I haven’t spent too long with the platform, it’s clear that this is something I could definitely trade with in the future. I’m not saying that it will overtake MT4 as the platform of choice, but more competition breeds a healthy market. Well done to ActForex for developing something that looks (at least from the outset) clean and easy to work with, without compromising on features. Overall, pretty cool indeed. Sounds quite promising. Many platforms suffer from unfriendly interfaces. Their excuse is that it is “more professional”. I wonder if MetaTrader will react with an upgrade of their own.